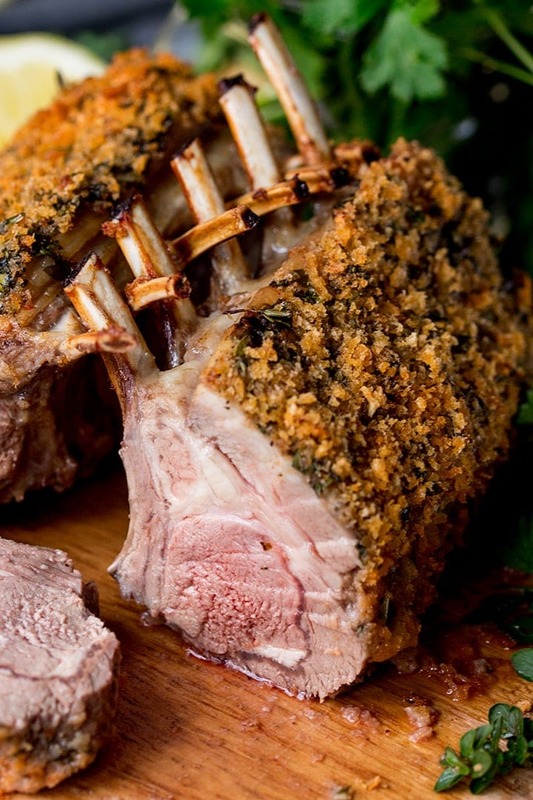 My Garlic, Lemon and Thyme Crusted Rack of Lamb makes a great centerpiece for Easter Dinner. Plus it’s so quick to cook too! Do you ever think about cooking dinner in terms of ROI (return on investment) – or is that just me?? Well if you do, this one totally hits the spot! 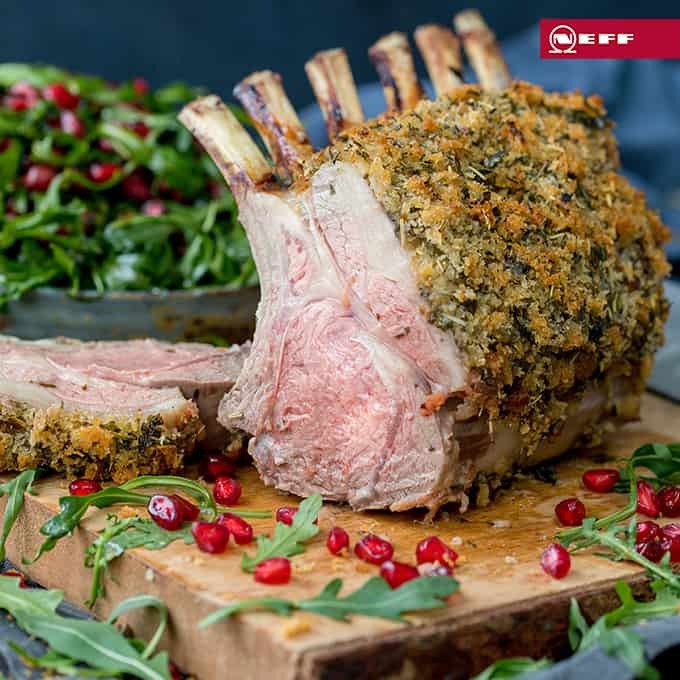 Now these racks of lamb are so delicious – succulent, flavourful, quick and easy to prepare and cook, AND they look impressive too. Which means they’re a great idea for that all important Easter Dinner! First we mix garlic, lemon zest, thyme, parsley, olive oil and salt & pepper in a bowl. Half of this mixture is spread onto the skin side of the two racks of lamb. This adds lovely flavour, and also helps the breadcrumb mixture to stick. Next we add breadcrumbs to the remaining herb mixture in the bowl, along with some paprika (for a bit more colour). 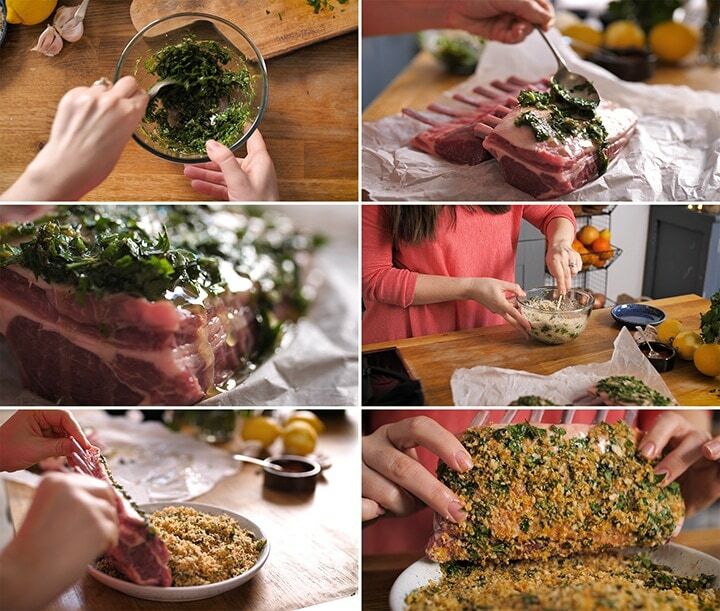 Roll the skin-sides of the lamb shanks in the crumb mixture, then cook in the oven for 20 minutes for the perfect medium-rare finish. I like to serve it with veggies and saute potatoes or boiled baby new potatoes. If you like this one, I also have a honey mustard version that I made for Neff. Sooooo good! 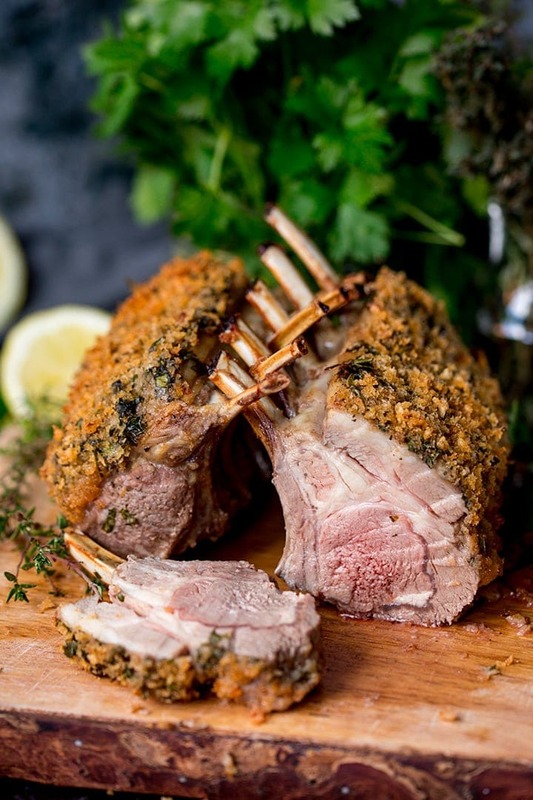 My Garlic, Lemon and Thyme Crusted Rack of Lamb makes a great centerpiece for Easter Dinner. Plus it's so quick to cook too! Place the oil (3tbsp) in a bowl with the salt (1/2 tsp), pepper (1/2 tsp), fresh parsley (2 tbsp, finely chopped), fresh thyme (2 tbsp, finely chopped), garlic (1 minced clove) and lemon zest (zest of 1 lemon). Stir together. Add half of the oil mixture to the panko breadcrumbs (1 1/4 cups or 60g) along with the paprika (1/2 tsp) and stir together until the oil coats the breadcrumbs. Spread the herb oil on the skin side of the racks of lamb. 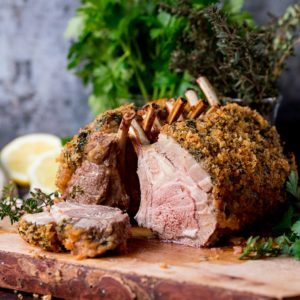 Press the breadcrumb mixture on top of the skin sides of the racks of lamb, pushing down so the breadcrumbs stick to the herb oil. Place the lamb in a roasting tin, bone-side-down, in the oven to cook. 20 minutes for medium-rare, 25 minutes for medium. Leave to rest for 5 minutes before serving. I'm using a French trimmed rack of lamb. This is a section of the ribs (usually 6 or 7 ribs). The term French-trimmed means the rib bones are exposed or 'frenched'. You can buy them ready-'frenched' from your butcher or large stores. I cook a small rack of lamb for 20 minutes for medium rare. Cook for 25 minutes for medium, or 30-35 minutes for well-done. Leave to rest for 5-10 minutes before carving. I often like to mix my breadcrumbs with oil before crumbing something. If you mix them wee and don't you too much oil, the breadcrumbs won't clump together. Mixing them in this way means you don't have to drizzle over oil before cooking in the oven. I find that drizzling the oil on, means some breadcrumbs will have oil on and some won't, so the result can be a little uneven. Use panko or fresh breadcrumbs. To make fresh breadcrumbs, you can grate fresh or slightly stale bread (takes ages though!) or whizz up bread in a food processor (much easier). Yes, use gluten free panko (Kikkoman do them) or make your own fresh breadcrumbs from gluten free bread. This recipe is best made right before cooking. I love to serve rack of lamb with saute potatoes and green vegetables. 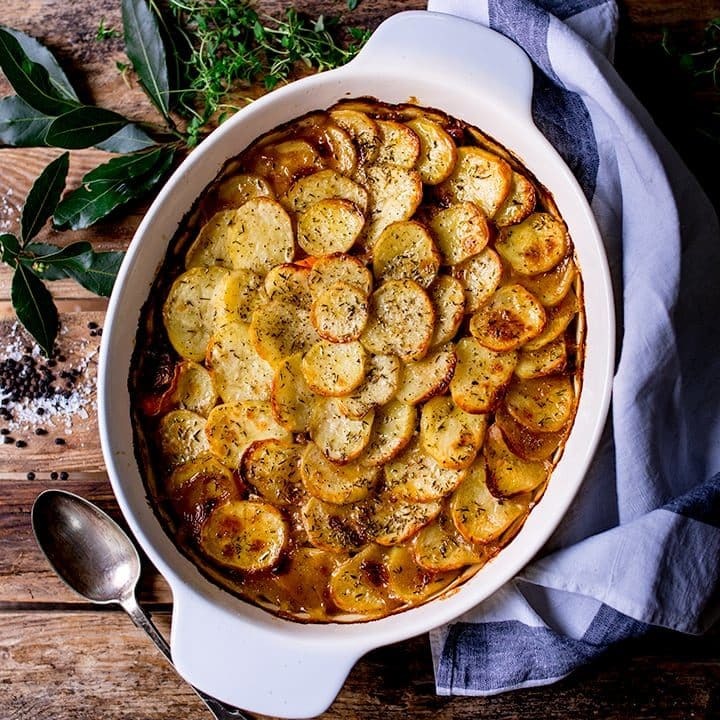 You could also serve with boiled baby new potatoes, roast or baked potatoes. Mint sauce or red currant jelly also makes a great accompaniment. Just looking at that crust makes my mouth water. I’ve pinned this to make in the very near futures. 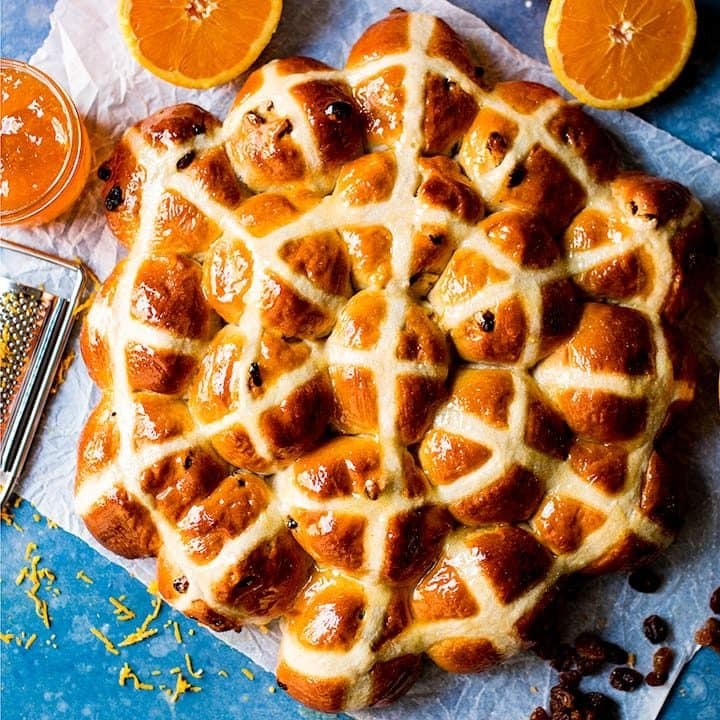 It looks just plain delicious! 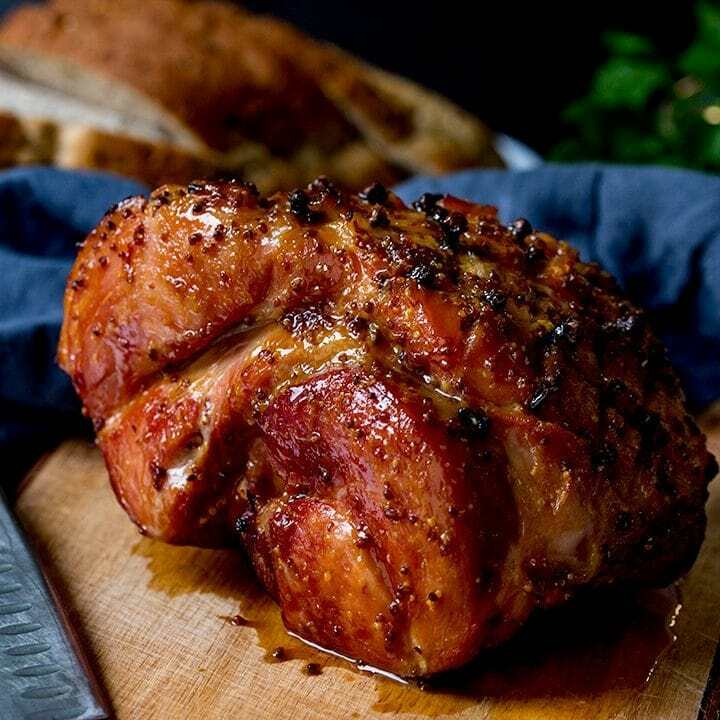 I’d be so honored if you shared this at our recipe party – What’s for Dinner! 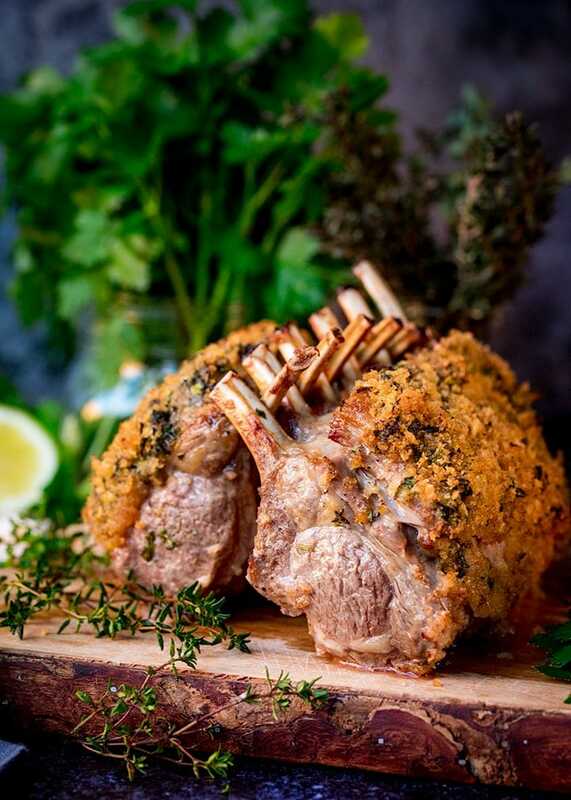 This will be my Easter centerpiece this year, I love lamb and this looks so delicious.